This week a CBC Ontario Today broadcast featured an open lines show with Danah Boyd, author of It’s Complicated: The Social Lives of Networked Teens. This week, our Tuesday night live voice discussion will take a look at the parent perspective. We recommend that you take time to listen to the CBC podcast of When Keeping an Eye on Kids Becomes Spying prior to Tuesday night. The session (June 3rd, 2014 at 8 p.m. EDT) will be hosted [here] to share your insights,ideas and ask questions. The meeting room will be open at 7:30. If you are joining us for the first time, allow a few minutes for the necessary plugins to download. We look forward to connecting with you for sharing and discussion. Modelling connected leading and learning is a critical element in our digital learning world. Connected learners need connected teachers and leaders. Try the OSSEMOOC experience where you can participate in connected leadership with a group which offers a supported approach. Based on the positive feedback and interest in the 30 Days of Learning in Ontario collaborative blogging project, OSSEMOOC will be running another collaborative blogging project during the month of June. The theme will be “a picture and post” based on what catches your attention on social media. 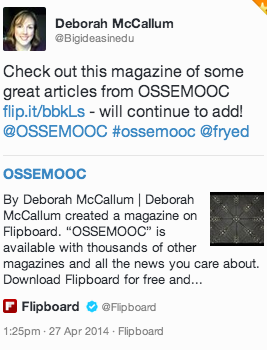 We would be delighted to include you on the OSSEMOOC blog. Participating is: as easy as 1 2 3. 1. Watch for interesting education related posts on Twitter, Google Plus, Facebook and/or any other social media sites you read. 2. Screen capture the tweet or post, and write a short paragraph (even 2 or 3 sentences) explaining why the tweet or post resonated with you. We look forward to connecting and leading with you as you share your learning. Interacting with your personal learning network (PLN) means great learning opportunities every day. A case in point is represented in this tweet I read from @ScottMcKenzie27. 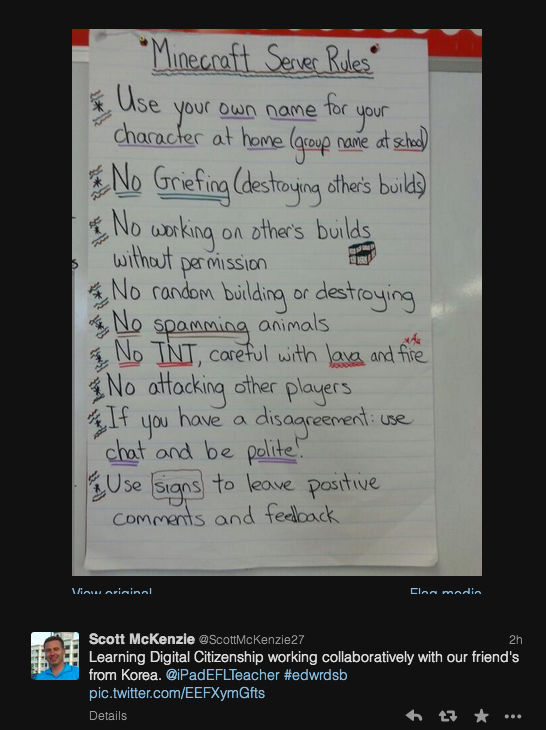 The approach Scott is taking with digital citizenship in his classroom really brings it to life through relationships, conversation, collaboration and a real world connected learning experience as evidenced through this screen capture of his tweet. Of course, not all our learning comes from our online connections. We learn from our f2f co-workers as well, when we take the time to sit down (or go for a walk) and talk about our work. I am very fortunate to work in a center that highly values the building of personal relationships and the informal sharing of our work and learning. We take time each month to celebrate birthdays and eat a special lunch together. It amazes me how much learning and how many new projects arise after we take this time to share the work we are doing in our different branches. Thank you so much to my colleague, Yvonne Morrison (EO, Aboriginal Education) for sharing her learning with me. I hope you find this topic as fascinating and engaging as I did. Have your say!!! On Monday May 26th (8:00 – 9:00 p.m. EDT), we will be providing an opportunity for you to learn more about the OSAPAC project on digital citizenship resources and provide feedback to the project team. The online meeting room will be open at 7:30 p.m. EDT. If you are joining us for the first time, please allow a few extra minutes to allow for the necessary downloads (plugins). During the last few weeks, we have focused on the topic of digital citizenship. The discussions and sharing of insights and personal experiences have been very rich. Our professional learning sessions for the next two weeks will be special events. On Tuesday May 20th, TEDxKitchenerED is presenting an event (7:30 – 9:30 p.m. EDT) centred around “the idea of Fostering Connectivity in the educational space can take on a variety of meanings. While its name leads many to the digital space, it simply means the state or capability of being connected. TEDxKitchenerED will look to highlight the many ways connectivity can be fostered in education.” Check out the speaker list [here]. We hope you will join us for this “OSSEM” event. Watch for a special OSSEMOOC connection! Mark your calendar: On Monday May 26th (8:00 – 9:00 p.m. EDT), we will be providing an opportunity for you to learn more about the OSAPAC project on digital citizenship resources and provide feedback to the project team. Additional details will be provided in a future blog post. Our Tuesday discussion this week (May 13, 2014 at 8 p.m. EDT) will continue our look at the evolving and complex area of Digital Citizenship. Join our live voice conversation [here] to share your insights,ideas and ask questions. The meeting room will be open at 7:30. Continue exploring the #digitalcitizenship and #digcit hashtags on Twitter as well as resources on the Scoop.it page here. The Digital Citizen, a weekly paper.li publication, may have resources of interest as well. 30 Days of Learning in Ontario: What Did We Learn Today? As the 30 Days of Learning in Ontario OSSEMOOC project comes to a close, we want to thank, and congratulate, all of the educators who took the opportunity to share their learning. 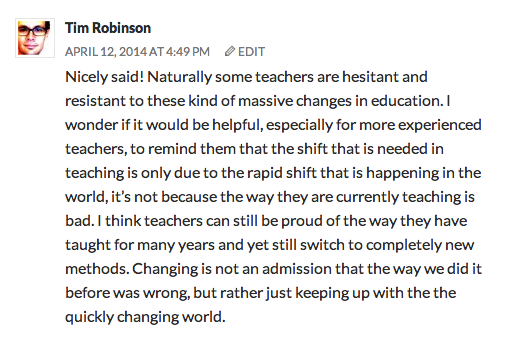 For some, it was their very first time posting their thinking in the blog format. We thank you for taking the time to let others learn from you. We hope that you will continue to share your learning and connect with others doing the same. Thank you as well to everyone who took the time to comment on the blog. You shared your response and your feedback, and kept the thinking and conversations going. One of our goals in OSSEMOOC is to have people connect and then create, to go off and learn and share, to sustain those connections and that learning. We were excited to see Deborah McCallum’s efforts to collate the 30 Days of Learning in a new format. Collaborative blogs give ownership to a group rather than an individual. As co-owners, we all anticipate the next learning. We are motivated to comment and continue the conversation as we are invested in this community of learners. Collaborative blogs encourage new thinking, invite new participants, expand our world and our learning. They give us a focus for reading and sharing. We learn by watching others. We teach by modelling the practices we value. Collaborative blogging allows us to model the action of making thinking visible. We all have a story to tell, and we learn from each other. Together we are stronger and wiser. Connected learning takes many forms: observing, reading, asking, reflecting, writing, speaking, audio, video and collaborating. Connected learning and leading is a participatory culture. It takes time, time to jump in, time to create new routines and time to build comfort. Courage is needed to put yourself “out there” and find your voice. It is worth the risk to gain insight, broader perspectives and recognize that “the smartest person in the room is the room”. In our technology enabled learning environments, connected students need connected teachers and leaders. As educators, I believe each of us owns nurturing those around us and role modelling. As pointed out in one of the blog posts, value encouragement and supporting each other with “just right” feedback is important for adult learners too. Each of the 30 days of learning bloggers has taken the leap of faith, put themselves “out there” to share their reflections and ideas. Congratulations to all for openly participating in the collaborative learning process. We often wonder why it is so hard to change thinking in education, to bring people into the world of connected learning. We learned from Tim’s comment that perhaps focusing on the changing world, while validating the work that has been done, is a key component of making this change happen. It’s hard to hit publish. But opportunity can be fleeting. Don’t be afraid to share. Be more dog and grab the frisbee when it comes your way. Carpe diem!